Can broadcasting compete with the Internet? Broadcasters are having a tough time in Washington. A number of efforts are aimed straight at the business from the FCC's recent decision to tighten ownership rules and claw bag big chunks of the broadcast spectrum for wireless, to a very vocal pay TV lobby pushing hard on Congress to reform retransmission consent. With so much going against them, it's easy to conclude that the broadcasting lobby, once the most powerful lobby on the Hill, may be on the outs. Certainly the medium has lost the glamour crown to the Internet. But calling the broadcasting industry a dinosaur may be a premature conclusion. 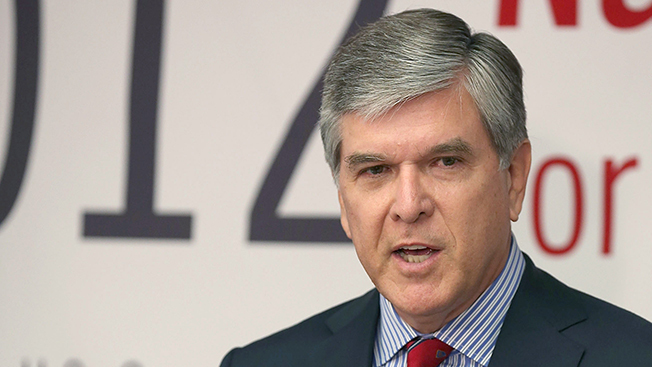 Wrapping up the industry's national convention in Las Vegas this week, Gordon Smith, president and CEO of the National Association of Broadcasters, remains confident he can turn things around. "While I may be frustrated, I'm not discouraged because I know how this ends," Smith said. Smith, a former Senator, spent the week talking with broadcasters, FCC commissioners and staffers, even holding a closed-door meeting with FCC chairman Tom Wheeler, who right now is enemy no. 1 among broadcasters. Coming off a very unpopular FCC vote that made it a lot tougher for two TV stations to share advertising sales, Wheeler faced a hostile audience. He put on his best charm offensive to try and convince broadcasters that he wasn't out to destroy the business. "Trust me. I get the skepticism. Here's the former head of the cable and the wireless industry at the NAB telling you he's your friend. There is no more ridiculous metaphor," Wheeler told broadcasters in Las Vegas. It didn't work. Broadcasters grumbled in the halls of the convention center over what they regarded as an ill-informed lecture from Wheeler who said he wanted to help TV stations "become digital information providers." Quipped Haim Saban, chairman and CEO of Saban Capital Group and Univision's board chairman, "FCC stands for Friendly Cable Commission." Despite broadcaster sentiment, Smith, ever the diplomat, is taking the high road. He's betting Wheeler, a former cable and wireless lobbyist, might see broadcasting differently after his time at the NAB's annual convention. "There's always value in seeing human faces and concerns, upfront and personal," said Smith. "Clearly he [Wheeler] said some things that missed the mark," said Smith. "He's encouraging us to put more content online, yet our websites are already the most visited. The notion that you can take broadcast content as a substitute for broadcasting invariably runs into the laws of physics; it will always crash." Compared to last week when the FCC voted to make it a lot tougher for two TV stations to share advertising sales, Smith said he is now feeling "more optimistic." Though there will be plenty more fights with the FCC, Smith remains confident that broadcasters can hold off cable and pay TV providers that would like to push Congress to insert all kinds of cable-friendly add-ons to a satellite bill that must be reauthorized by the end of the year. But broadcasters hold a card that is often overlooked by those that take on broadcasters in Congress: the local news. "We have a lot of swat in the corridors of power because we have something that is unique and indispensable, live, local broadcasting that includes all the American people. Members of Congress understand that," Smith said. "We are the very best megaphone to their constituents," Smith said.